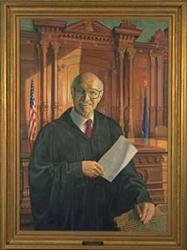 Justice Thomas G. Kavanaugh was elected to the Michigan Supreme Court in 1968. He was re-elected in 1976, and his term ended in 1984. Justice Kavanaugh served as Chief Justice from 1975 – 1979. Justice Kavanaugh graduated from the University of Notre Dame and the Detroit College of Law (now Michigan State University College of Law).